I really like the layout as it is very easy to understand and utilize. I also like how you are able to see the other users. It is very good at telling you your voice quality. It also works effectively as a system and allows for easy utilization as well as streamlined productivity. The layout works extremely well. I dislike how sometimes the system will kick you out or sometimes it will freeze up and not allow you to take a call. Sometimes you have to hang up on a call and call the person back in order for a call to not be staticky. Other than that for the most part the system is extremely easy to use. I think that bright patterns works very well. I would definitely recommend it to others who are looking for an easy to use system that allows for a large influx of calls daily. I find that Bright Patterns is extremely easy to use and it helps our team work effectively with the calls that we have come in on a daily basis. Bright Pattern setup and through out the continued use of the services provides outstanding customer support. Setting up your phone path is not that simple for a first timer, but they walked me through and setup the service. Running reports is easy to understand. If you run into any issues, there support team is ready to assist in a timely manner. When it comes to setting up the phone tree portion of the service when i get a new campaign (which is not that often) I don't seem to remeber all the steps. Thankfully the support team is ready to help and provide expertise assistance. My off shore team has explained other systems do not compare to the reliability of being availble / connectivity. Bright Pattern is helping my support team reach an SLA of 70% of all calls answered in 30 secs , 99% of the time we are in the high 90 % since we can use the phone tree to assist our users and have the priority campaign reach us immediately. The support we receive from Bright Pattern is easily the best in the industry. They're incredibly responsive to any issues we face (which is fairly minimal to zero), and communicate quickly if there are any service interruptions that may affect incoming volume. However, I should note that issues faced thus far are the result of a third party. Examples include carrier issues, or service outages affecting a region of users. Our uptime has been 99% in all of the previous year. It's also incredibly easy to integrate this tool with various commercially available CRM's, such as Zendesk (our CRM of choice). Their isn't a lot of customization for reporting in a GUI. It requires the use of another software tool to build queries or modify templates. However, Bright Pattern provides these templates that can be adjusted to meet your reporting needs, and the default reports will generally provide you with the information you require. Schedule a call, allow them to listen to your business requirements. I can't say this enough, Bright Pattern's support has been one of the better ones we've dealt with in years. We have a "shared" queue environment, with various clients being assisted by the same employees. The robust backend customization has allowed us to scale operations to properly queue manage various queues, with the same agents, without needing to switch between Bright Pattern instances. It also doesn't require a landline at each desk, since it works over soft phone. Pretty solid system and can be easy to administer. Sometimes it's hard to determine how to do things since documentation is very sketchy. I also have an issue on the amount of time it takes to return with an answer to an issue, yes you get an instant response with a ticket but getting the answer is the problem. Trying to resolve an issue with getting call data every 15 minutes. Call records are dropped from the report and the engineers don't know why or it's low on their list of things to do. The power of predictive dialing technology and the flexibility offered by a first-rate company. With Bright Pattern, we have the ability to be agile and effective. I dislike my inability to integrate data management with my primary CRM, which does not like to play with others. This is a comprehensive solution that is very powerful. We have the task to talk to tens, sometimes hundreds of thousands of voters in a very short amount of time. Bright Pattern offers a way to meet our goal. "A Year filled with enhancements and drawbacks"
So far the pieces of the system we have been able to get working in a stable manner have been solid. Some issues we have had and are having seem simple and quick but the response time is into several months before it is resolved and or receive a response back on what they've found. Make sure you have a firm knowledge of VoIP and what you are trying to do. Seek their help and advice as much as you to as they know their system best. There is always room for improvements with any system but they are willing to listen and b ounce ideas off you and with you. all in one solution for voice, chat and email channels of communications with our support staff. "Best Omnichannel contact center platform "
After evaluating all the known solutions from the big boys - we found the Bright Pattern solution to be the most innovative and disruptive solution. Pretty much everything and all features we wanted are out-of-the-box. Integrations with IBM Watson provide rich analytics and self service capabilities through the IVR and virtual agent. And where we needed to integrate the IVR and the other workflows with our CRM, the open API's and pre-built integrations made the task super easy and seamless. The web based admin portal with drag and drop functionality is unparalleled and really makes it easy to configure and manage the contact center within minutes and removes the complexity that you see in traditional platforms. Overall - a full featured contact center platform, capable of competing with the industry leaders, yet far more simpler and easier to use. Implementation and migration was a breeze - far less effort than what we had expected. They could improve on the UC aspects of the platform. Needed a omnichannel solution capable of tracking the entire customer journey across all channels. "Bright Pattern is the best softphone VoIP provider we've found"
Bright Pattern is the best softphone VoIP provider we've found. Their service is top quality - we've had no issues since we migrated over a year ago. They were able to help us build a relatively complex and unique phone routing system. When they didn't have a feature we needed, they helped us build it or figure out a way to reach the same goal in a different way. Their support team has been world class. It has been a pleasure to work with them and most of the time I don't have to think about our phone system - which is exactly what I want - a scalable, no fuss, working system for our team. Multiple site, multiple team phone system that keeps us connected to our customers. The flexibility, the cutting edge technology, and integrations with Salesforce. Love the MMS/SMS functionality as well. The support team is knowledgeable and helpful. In an effort to make it so useful, sometimes the execution is a little quirky and wonky. Deeper Salesforce integrations are not as easy and there are some strange nuances and idiosyncracies with getting things working the way they are intended. A more mobile-friendly eco-system would be powerful for outside agents. The support team, while nice and knowledgeable and helpful, sometimes seems to be learning along with me. Bright Pattern is our primary voice/text/mms communication platform. "A decent call center platform with adaptability"
Integrates neatly with other platforms like Zendesk as an app. Versatile in your ability to accept calls via softphone, deskphone, or route to an external number. Softphone frequently encounters errors or logs itself out when tabs are refreshed or new tabs are opened. This may be due to using the system as an app within Zendesk. Supplementing e-mail support and allowing clients to call for a more streamlined troubleshooting process. 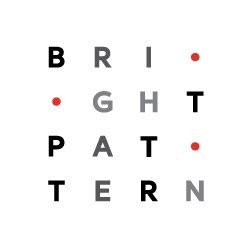 "25 Years of Call Center Experience, BrightPattern is the best." Ease of use, coupled with excellent features.Virtual queue callback should be more of a "thing". Virtual queue callback should be more of a "thing". If you are on the bubble, buy it. Period. One of the easiest systems to use I have encountered in 25 years of call center experience. The technology is amazing, and the customer service even better! All the features are out of the box and easy to set up. I Have been working 10 years in customer experience with various editor (Genesys, Avaya, Cisco) and All the features that are really used in contact center are delivered in BrightPattern. Also they did not fall in the trap of over complexifying the solution to answer specific needs that will only be used by 1% of the customers. I also enjoyed a lot working with Brightpatterns team, they know their product and are really open to feedback and requests. Customization of the Desktop is too limited at the moment but the team is very response in handling the enhancement request. We consumed a product of bright pattern that was sold by Aspect, so support for complex cases took time until it reached developers. "Bright Pattern for Call Center"
What I like most about Bright Pattern is that you can see who is on the phones and who is not by simply putting their name in the directory search. I don't like that sometimes Bright Pattern drops calls. Getting Health Insurance Member's to the correct department. "BrightPattern is the best customer service I have ever had." Customer service. Brightpattern Customer Service is second to none. Have not dealt with better in 25+ years of IT Experience. API Documentation. The API documentation was obviously written by developers. There is not enough detail in the documentation or data validation by the API. Best decision you will ever make. Much better ROI than the other cloud telephony providers. Low cost service, High uptime, superior customer service. Does what it says on the tin and is very easy to use. Excellent customer service, the guys are always available for a quick call. Our sytems are not set up correctly to integrate all our systems. which would make life so much easier. We moved away from a reseller of the product due to their bad service, massive difference in service. The guys are extremely helpful. "It actually works and almost no outages in 3 years. " I dislike that their reporting it could use work. Not a lot of options, but I do like how simple the export method is, csv. makes everyone's life easier. if you're looking for a well priced option for customer support solutions. I would recommend BP. It is our phone system, it works great, it does chat too; which has been an enormous help. "Bright Pattern continues to excel"
This is real deal contact center solution, that is scalable and enterprise strength. Experienced Executive team and knowledgeable engineering and support teams improve the odds of successful rollout and implementation. I would say some of the navigation/functionality can be slightly more user friendly. Probably, UI issue, struggled few times. Increased productivity mostly, but also agent's higher level of satisfaction and better flexibility, in comparison with some competitors. "Bright Pattern Does What It Says"
Bright Pattern provides a great way to incorporate calling into our more standard email-based support system. It links all calls to a support ticket to allow for future review if/when necessary. Its integration with our support system could be improved in some areas, as the complexities that come with a fusion of call-based and email-based support can sometimes expose bugs in Bright Pattern's functionality. We use Bright Pattern as a great way for our company to provide call-based support without too severe a departure from our traditional email-based support offering. It helps us to avoid costs associated with the employment of a call center. It is very easy to find all of the information that is being requested. Sometimes the phone button does not come up. I'm given homeowners they account balance. The system makes it easy to get to. "Fast to implement, out of the box complete, working Contact Center Solution"
It is easy to use, fast to implement. Documantation is clear and easy to understand. The ease of use and obviousness of its user interface for both agents, supervisors and system administrators is a plus. Even without referring to docs one can find its way around. Everything is web based with the help of a browser plugin, all user interfaces are running in a web browser. Compatible with all major web browsers. Large call center deployments are made easy. The best outbound dialler for large scale call centers I have seen. Good quality reporting data accumulation for future reports that may be needed. There is a visible effort of the company, making the integration with third party applications easier but some crucial points are yet missing. Not a bad idea, go on and see for yourself. Productivity of agents gone much higher. Management of outbound predictive dialler campaigns helped our customers to realize more calls in the same time span and as a result of this more profit. Good built in reporting and being able to add more custom reports made our cutomers have a good visibility of what they are doing and what they should do to perform better. "Bright Pattern - a world of difference"
Documentation and customer support put other CCaaS platforms to shame. Not as well known as 'the big guys' but this also gives us a competitive advantage! Ability to take our existing phone system configurations (users, skills, proficiencies, etc.) and migrate into Bright Pattern - top notch! It periodically just logs out and suddenly your missing calls. Like sometimes it's fine for hours, then sometimes it logs you out every 10 minutes. Able to allow members to call in under only specific circumstances. The manuals/guides are hard to follow and reporting is not customizable within the software itself. customer service is usually very prompt. Bugs. Since the upgrade it feels as though there have been more bugs. It's also been extremely sluggish to get our integration completed. The UI could be easier to use too. Looking forward to the auditing features that are coming soon. Call distribution. Would be great to have more workforce management built in too. "Call Center Soft Ware as a Service"
Have a few training session with bright pattern on features functionalities and reports. I do not like that when you are pulling calls you can not sort in the columns. On the performance side, Bright Pattern is easy to start, highly customizable, fully featured, and very scalable. In minutes, you can have a campaigns set up and running. Customer service is very good. The staff is knowledgeable and very responsive to questions and requests. List management is good overall, but can be more robust. For example, it would be nice to be able to make changes to a list during a live campaign. There are so many options, if I have questions with anything the support team is very quick to respond. There are so many different use case scenarios I am not sure that we are utilizing the product to the fullest. The platform has all the channels needed to support your client base in the call center environment. A more robust scripting engine for clients/vendors who don't have a CRM. "Good Quality Calling, Decent UI"
call quality was good, call routing was setup by our admin and functioned correctly. the user interface seemed dated, wasn't very pretty. * We monitor all Bright Pattern reviews to prevent fraudulent reviews and keep review quality high. We do not post reviews by company employees or direct competitors. Validated reviews require the user to submit a screenshot of the product containing their user ID, in order to verify a user is an actual user of the product. Hi there! Are you looking to implement a solution like Bright Pattern?